I really love homemade breads. It doesn’t matter if they are yeast breads or quick breads I love them all. There is just something about the aroma of bread baking in the oven that you cannot beat. And then there is eating that first warm slice of bread that makes my mouth water. On my latest visit to my public library I found an interesting cookbook called Kneadlessly Simple by Nancy Baggett. It is a cookbook that has recipes that contain yeast in each of the recipes but you don’t have to knead them at all. I was quite intrigued by this because I thought with yeast breads that kneading the dough was always part of the process. It turns out that you may not have to knead it but you let the bread set for many hours, so I believe that is the reason that there is no kneading involved (my guess). I have to say that I was skeptical about making the recipe, but I am glad that I decided to. My family loved the bread and the streusel that went with the bread was terrific. 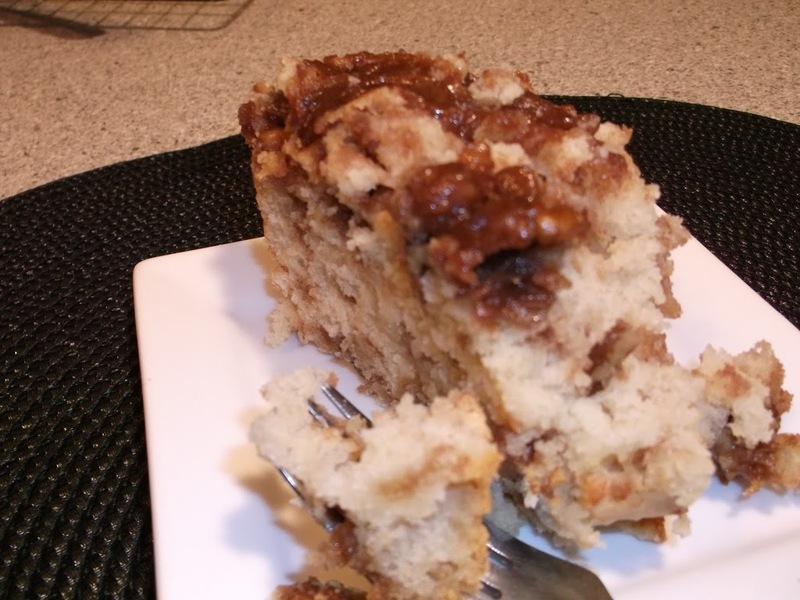 I have made several different streusels for coffeecake, but I have to say that this one was the best one by far. It is a coffeecake that I know that I will be making for a long time coming. 2 1/3 cups unbleached all-purpose flour, plus 2/3 cup plus more as needed. First Rise: In a large bowl, thoroughly stir together 2 1/3 cups of the flour, 2 tablespoons of the sugar, the salt, and yeast. Vigorously stir in the water, scraping down the bowl and mixing until the dough is thoroughly blended. If the mixture is too dry to incorporate the flour, a bit at a time, mix in just enough more water to blend the ingredients. If the mixture is soft, stir in enough more flour to make it firm, but not hard to stir. Evenly brush the top lightly with vegetable oil. Tightly cover the bowl with plastic wrap. If desired, for best flavor or for convenience, refrigerate for 3 to 4 hours. Then let rise at cool room temperature for 12 to 18 hours. Second Rise: In a medium bowl, stir together the remaining 3 to 5 tablespoons of sugar, the milk powder, and butter, then mix in the eggs until well blended. Gradually add the egg mixture, the 2/3 cup flour, to the dough, mixing until evenly incorporated: this will take several minutes so it’s best to use a dough hook and heavy-duty mixer on low, if possible. If necessary, add in enough more flour to yield a hard-to-stir dough, scraping down the bowl sides carefully. Stir a generous half of the streusel into the batch of dough. For a shaped, round coffeecake, turn out the dough into a well-oiled or nonstick spray-coated 8 to 12 quart angel food pan. 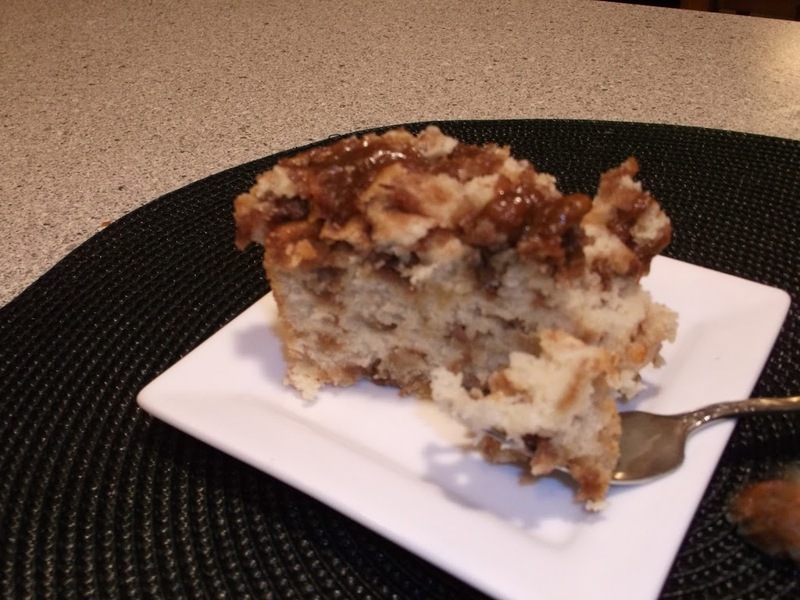 For a rectangular coffeecake, turn out the dough in a well oiled 9 x 13 inch flat baking dish. Spread the dough out evenly using and oiled rubber spatula. Sprinkle the remaining streusel evenly over the dough. Cover the pan with nonstick spray coated plastic wrap. Let Rise Using Any Of These Methods: for a 2 to 3 hour regular rise, let stand at warm room temperature, for a 1 1/2 to 2 1/2 hour accelerated rise, let stand in a turned off microwave along with 1 cup of boiling hot water; or for an extended rise, refrigerate for 4 to 36 hours, then set out at room temperature. If the dough nears the plastic wrap, remove it and continue the rise until the dough has doubled in deflated size. Baking: Bake on the lower rack for 30 to 40 minutes for the rectangular coffeecake or 40 to 50 minutes for the ring-shaped coffeecake, until the top is nicely browned. If necessary, cover with foil for the last 15 to 20 minutes to prevent over browning. Then bake for another 5 to 10 minutes to ensure the center is done. Cool in the pan on a wire rack for 15 minutes. If baked in an angel food pan, run a knife around the center tube and sides to loosen the loaf, then lift it up and onto the rack. In a medium bowl, thoroughly stir together the brown sugar, flour, cinnamon, and salt, breaking up any lumps of sugar as you work. Stir in the butter until evenly incorporated and the mixture forms small clumps. Stir in the nuts. Refrigerate until firmed up, about an hour. Just before using, break up any large clumps with fingertips or a pastry cutter. Use as directed in the coffeecake recipe. If not using immediately, refrigerate, air-tight, for up to 3 weeks. Let warm up slightly before using. 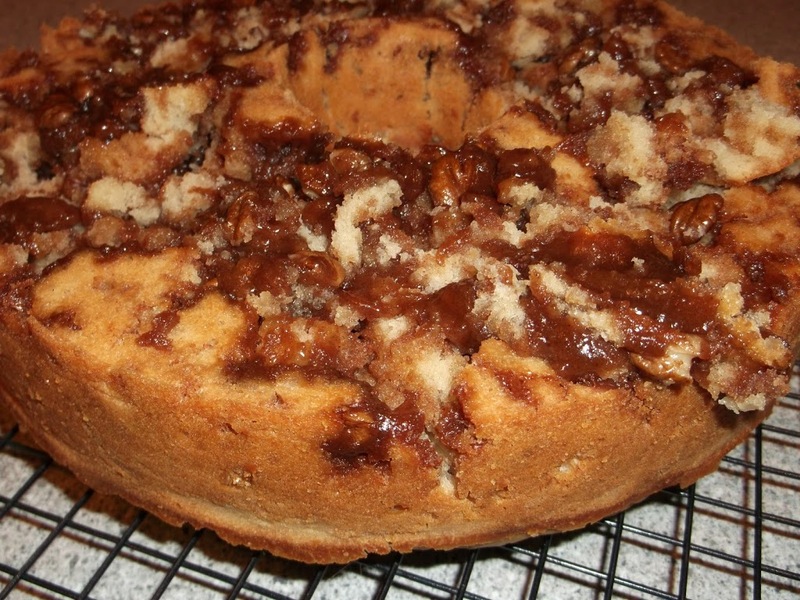 Love streusel cakes…they are the best coffeecake! The streusel part on top is my favorite part! This looks crazy delicious! I love the yeast breads that you don’t have to knead. Have you ever made the NY Times overnight bread? It’s really good.